Description: There's a new sheriff in town! Part of the allure of Cowboy Action Shooting is the chance to step into the past... to experience life the way it used to be when two six-guns and a pair of quick hands were a cowboy's best friends. 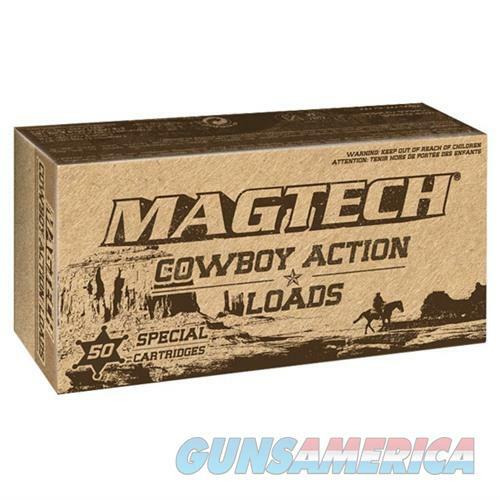 Magtech Old West Cowboy Action Loads were developed specifically for people like you... Cowboy Action Shooting enthusiasts who know how the West was won and never miss a chance to prove it. Old West loads are more than just authentic, they PERFORM! These flat-nose bullets deliver reliable knockdown power that puts steel targets down on the first shot. Superior components and construction assure trouble-free performance in both single action revolvers and lever action rifles. The best part Magtech Old West loads are affordably priced, giving you the ability to shoot up the town without shooting your budget. Our Cowboy Action rounds are loaded using specifications written by the Single Action Shooting Society (SASS).